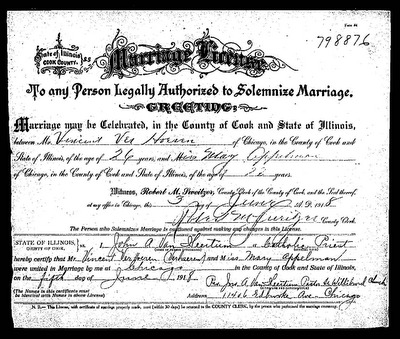 FamilySearch has Cook County marriage license images from 1871 to 1920. 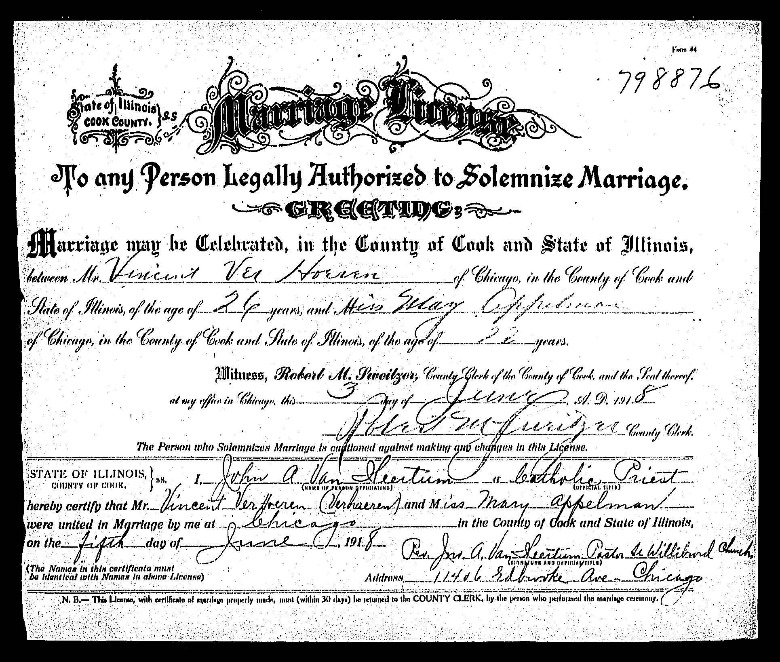 A search of "Smith" at CookCountyGenealogy.com suggests that marriage licenses are available there from 1930 forward. So what about the licenses from 1921-1929? Up until now, I've always said, "There's no public index. Just mail in a search request form to the Cook County Clerk's office." I've done that successfully for my own research. Yesterday a fellow researcher (who wants to remain anonymous) mentioned an Ancestry.com database called Cook County, Illinois Marriage Indexes, 1912-1924, new as of 17 Oct 2011. 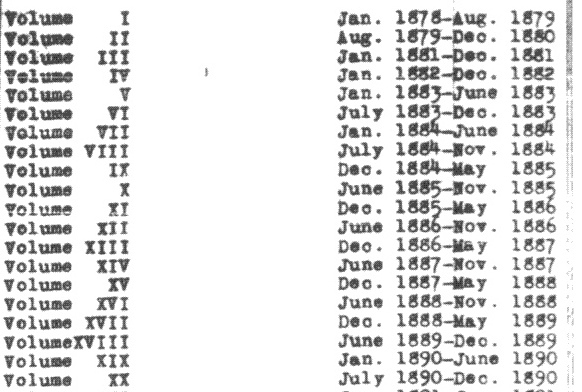 The notes say "The majority of these records come from the years 1914-1923" but the index still opens up a few more years and gives us an alternate way of searching before 1921. 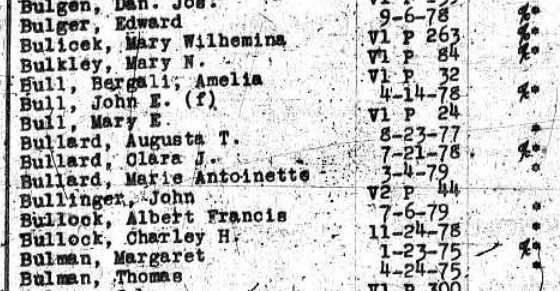 As you can see above, the index is alphabetical with both brides and grooms listed and it provides the name of the spouse, a date, and a serial number. Comparing an entry with a marriage license (I chose Mary Appelman) suggests that the date is the marriage date (not the date the license was issued) and the serial number is the license number. I can see a few ways that this index would be useful. If you find a 1921-1924 marriage listed here, it's pretty certain that a $15 search request to the county will result in a "found" result. If you can't find a marriage through 1920 at FamilySearch but can find the name here, it's likely that the license is online, just indexed in an interesting way. Keep looking. Search the Ancestry index by date, use other names to enter the FamilySearch database and then browse forward or backward to find the right license number. One caution. 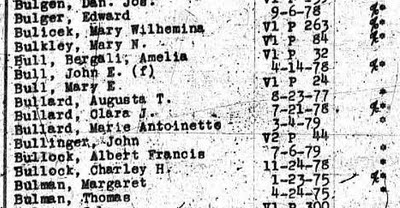 The marriage indexes to 1916 available on FamilySearch microfilm include entries for licenses that weren't returned and so it can't be assumed that a couple married just because their names are in those indexes. (On the other hand, it's also not possible to assume that they didn't marry; it's possible the officiator simply forgot to send the license back to the clerk's office.) It would be tempting to use this new index to confirm a couple's marriage, but it's probably not wise without knowing how the index was created. 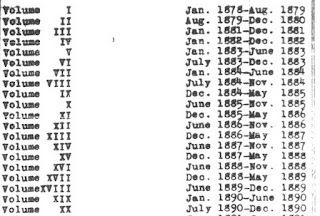 A client let me know that Sam Fink's Index, more formally known as Cook County, Illinois Marriage and Death Indexes, 1833-1889 is now online at Ancestry.com. Great news! It indexes marriages 1833–1871 and deaths 1833-1889 that were mentioned in Chicago newspapers so it's a very useful pre-Fire resource. In this post I'll tell you a little bit about the man who compiled the index, share tips on how to use the marriage and death index entries to find further information, and suggest ways to access the indexed newspapers from a distance. So, who was Sam Fink and why did he go to so much effort to make an index of Chicago marriages and deaths? According to his obituary--he died on a cruise ship at the age of 88 in February of 1999--he was "an attorney who made his living as an investigator and genealogist." (Chicago Sun-Times, 7 Feb 1999, accessed through GenealogyBank.com) He was a professional researcher who dealt "exclusively with problems of determining the true and lawful heirs in estate matters, trusts, dormant bank accounts, and insurance policies." (Flavin, Genevieve. "How to Hunt Your Heritage." Chicago Tribune (1963-Current file): B4. ProQuest Historical Newspapers: Chicago Tribune (1849-1987). Mar 22 1972. Web. 1 Nov. 2011 <http://search.proquest.com/docview/170291575?accountid=6327>.) I think he created this index as a tool to use in his work. These entries are also included in the Illinois Statewide Marriage Index. They show "Fink" in the license number field but don't provide the newspaper code. So, what do you do once you've found a match in the index? First, use the code to determine the newspaper title(s). Then search out the matching article. If you're in the Chicago area, these newspapers can be found on microfilm at the Harold Washington Library. Just take the L and get off at Library--State and Van Buren. The Chicago Public Library website has some very helpful online information about local newspapers including a link to a timeline from the Encyclopedia of Chicago--which papers were published when--and a list of holdings with information on how to request obituary searches through your library's interlibrary loan department. Chicago newspapers are also available at the Abraham Lincoln Presidential Library in Springfield. More information can be found on their Newspaper Microfilm Collection page. If you don't have easy access to the papers, Molly Kennedy, a researcher on our Genlighten.com site, offers newspaper searches with quick turnaround. And some of the papers are online. The Chicago Tribune can be found at Fold3.com and ProQuest's Chicago Tribune Historical Archives is available through many libraries. GenealogyBank.com offers the newspapers listed below. Unfortunately, it doesn't seem to be possible to browse the pages and sometimes I find it hard to pull up matching entries using the name search. Sam Fink's death index is divided into four sections: 1833-1874, 1875-1879, 1880-1884, and 1885-1889. Like the marriage index, many of the death index entries include a newspaper date and a code to tell you which title to check. An example would be the entry for Albert Francis Bullook below. Mention of his Albert's death occurs in the 6 Jul 1879 of the Chicago Tribune. When you use the index you'll notice that some of the later death entries list a name, a volume, and a page number. Some entries, like the one for Mary Wilhemina Bulicek, include a volume and page along with newspaper codes and some, like the one for Mary Bull just provide a volume and page number. The notes at Ancestry say "When the death entries came from Cook County death records, they list only a name and a volume and page number." The question is, what "Cook County death records" do these numbers refer to? I have an idea and I will follow up to see if I can learn more the next time I'm downtown. In the meantime, though, I don't believe they refer to the early register books held by the Cook County Clerk's Office. Those volumes were distinguished by letters. 1) First, check the key above to determine an approximate year of death. Mary's record is in volume 1 so her death was recorded between January of 1878 and August of 1879. 3) Use the death date as an entry point to searching newspapers. In this case the death notice was on page 8 the day after Mary's death. If no newspaper code is given, follow the steps above to estimate the year of death and search the Illinois Statewide Death Index. Then use the information from that index to locate the death record on Family History Library microfilm or in the database at FamilySearch.